Every now and then a rather unique and gorgeous looking installation comes along for mobile operating systems that seems to be a must have download. That would certainly seem to apply to the Real Widget offering on the Google Play Store that is available for Android smartphones running Android Ice Cream Sandwich or above. 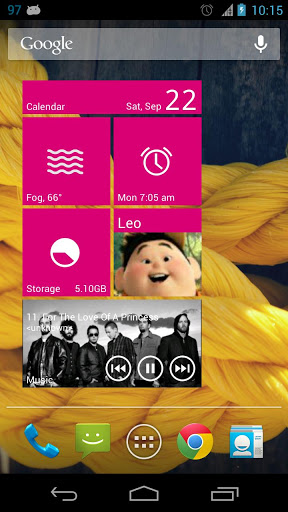 The widget itself promises to offer the look, feel and styling of Windows Phone directly on the home screen of an Android device. It would take an extremely cold person to deny the beauty of the Metro styling that comes with the Windows Phone and Windows 8 operating systems. The clinical and clean tiles offer a fantastic way to visualize and interact with a variety of content so it seems only fair that users of additional mobile platforms should be able to experience that. Real Widget offers Android users the ability to experience almost all of the functionality that comes with a Windows Phone desktop. One of the great things about the widget is the large amount of customization options that comes with it. Users have the ability to change pretty much every aspect of the tiles including using custom icons and changing the color of those icons as well as amending the font type to suit individual tastes. In addition to those options the widget allows the background image and color of the tile to be changed to the user’s liking. The power of the package really comes from the fact that you can add pretty much all installed applications to the widget to have them visualized and represented in a Metro way right on the launcher of the Android device. Additional components can also be used directly with the package such as Bluetooth, a battery indicator, cellular data toggles, traffic statistics, brightness toggles, weather access, Gmail access and much more. Although the Real Widget package clearly offers a huge set of benefits to Android users, there has been some issues surrounding the excessive battery and power consumption that seems to come attached to the package. There is a free of charge light version available so it may be worth giving that a try and monitoring its power consumption in the first instance. (Source: Real Widget for Android on the Play Store).